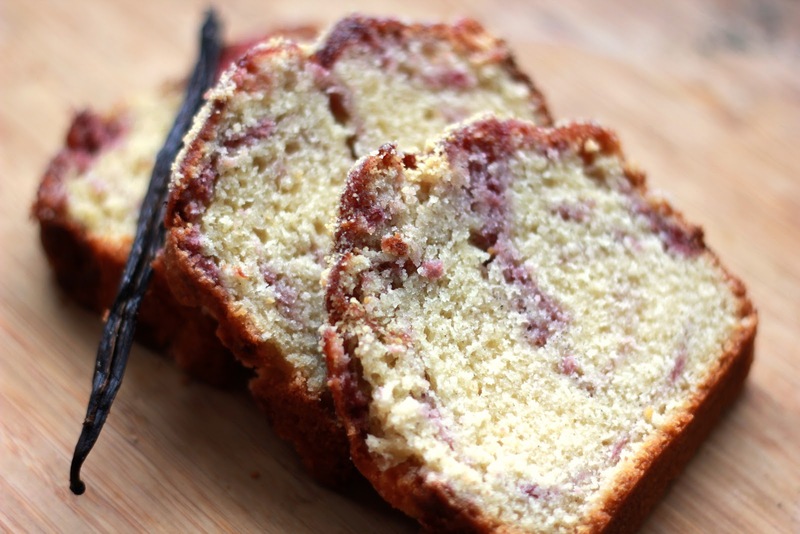 What could be more retro than a marble cake? Remember the ones that would always turn up at the Primary School bring and buy sale? Well this one has grown up. Half raspberry ripple, half marble, this one would saunter through the school gates in a pair of stilettos and a puff-ball skirt and start flirting with the most attractive teacher by the ice cream van. Don't omit the vanilla pod if you can help it - the rich, exotic scent as you slice it open is incredibly addictive, and the flavour will transform your cake from sweet and sticky to suave and sultry. Sift in the remaining flour in batches, folding in using a metal spoon. Add the almonds, along with enough milk to make a smooth batter and stir gently to combine. Bake for 40-50 minutes, until the top is set and a skewer comes out clean. Leave to cool in the tin for a few minutes, then turn out onto a wire rack and remove the greaseproof paper. Gently melt the raspberry jam in a saucepan, adding a quick splash of water if it looks too thick. Set aside. Yes please, on this cold cold day. Oh, HELLO. I'm all over this. Looks lush! Han, I used to be a hater too, until almond croissants made me see the light. You could use hazelnuts instead perhaps - get some blanched ones and grind them in a coffee or spice grinder. My friend made this as my office leaving cake! It was so tasty. And the raspberry ripple made a smiley face. Oooh Geraldine, that sounds splendid, especially with fresh, zingy mediterranean lemons. And a pun! Always appreciated. Glad you had a chance to try Sian! I tried this and it looked great but drooped in the middle after I took it out the oven.. Maybe I didn't fold in the flour gently enough or maybe added the eggs too fast? Also, I didn't get how to make the ripples come out nice. Are you saying that you add one spoon of plain mixture in and the put one spoon of the raspberry mixture on top of that? It tasted bloomin fabulous though! Hi Andy! Glad to hear it tasted great (love raspberries). Did you open the door at all whilst the cake was mid-way through baking? That can sometimes cause the structure to fall. Folding the flour in gently (so that it's just combined but there are no streaks showing) also means that it will rise better. I spooned my mixture in alternately, so one spoon of plain, then one spoon of raspberry next to each other (rather than on top of each other) in the tin, then swirled the skewer through it all. Hope that helps and that you enjoyed the cake anyway!